We’ve been planning this Turkish update for a while and decided not to withhold it after Saturday. As much as the terror act is shocking, we’re sure Turkish people will prevail as they’ve proven so many times now. When normalcy is restored they will continue one of the world’s biggest stadium replacement programmes if not the single most impressive. Only this year three major teams left their old/temporary stadiums for newly built arenas: Beşiktaş, Sivasspor and Eskişehirspor. They follow similar projects in Antalya, Mersin, Konya and many others. So far we’ve only shown you Beşiktaş of the three stadiums delivered this year. Now we’re making it up with Sivas and Eskişehir as two further stadiums await opening in Trabzon and Gaziantep. New stadium for Eskişehirspor was planned in the western outskirts of the city, thus forcing football games from the centrally-located Atatürk Stadium, now earmarked for new non-sporting development. Interestingly, “Es-Es” fans intend to call the new stadium as they did the old, which they highlighted with a black Atatürk Stadyumu banner unveiled outside the new stadium several days before it opened on November 21. The stadium’s concept was created in the renowned office of Bahadir Kul, where the idea of a stadium inspired by dynamic movement of a football was created. While looking very dynamically in renderings, the vision lost a lot of its fluency during construction. Works were due for launch in 2012 but procedures took longer than planned and contractors eventually entered the site in spring of 2013. Expected delivery date was set at 2015 but, again, delays were seen. Eventually the building was opened in late November 2016 and even then wasn’t entirely ready, also seeing criticism over compromised quality of the field and furnishings. Its price rose from TRY 107 million to 130 million so far ($38m). Double-tiered stands were designed with 33,000 people in mind. Interestingly, skyboxes are placed on both sides of the field rather than the usual west where most of the hospitality areas are usually located. There are three restaurants at the stadium while a nearly 13,000-square-meter parking hidden beneath the stands. Complete floor space of the stadium is 58,700 m2 spread across 5 floors, one below ground level and four above it. Seeing the extent of works it can be said that the stadium’s price was low. It was contracted for TRY 82 million ($27m). Unfortunately construction took much longer than expected, lasting well over 1,100 days, a year behind the initial 800-day deadline. It’s not only a western outskirt of Ankara, back in 1974 the stadium in Sincan was built almost in the middle of nowhere, surrounded with farmlands. 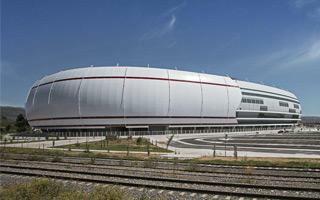 Its role grew when the current stands were built in 2005, able to hold almost 20,000 people. In 2014, after establishment of Osmanlispor, the stadium was upgraded to match the club’s aspirations. New seats, 20 private boxes in the west stand, but above all brand new membrane roof led to significant improvement and made the building compliant with international regulations. Still, the seating layout was created for athletics rather than football, which together with remote location makes the stadium unattractive in the long term. Osmanlispor are expected to relocate to 06 Arena in 2018. Located across 62,255 m2 of land, the stadium will operate just meters outside local subway station, assuring convenient access to supporters. The stadium itself will cover 37,765 m2, providing regular infrastructure for tenants, players and hospitality areas (with 42 boxes), but is also expected to host a mosque among other secondary uses.